I’m in the process of taking out my dreads. And I’d be remiss if I didn’t write a post on this one topic that I have found so little information about. There are tons of opinions out there on whether and why you should or shouldn’t root-flip/interlock/latch-hook your dreads. I’ve read a lot of it. It’s mostly negative. But here I was, on my fourth attempt at dreading my thin, silky white girl hair, and I’m thinking maybe I should just go with what seems to work for my hair rather than listening to all the “no, don’t, never” rules about how to make and maintain your dreads. So since I’m combing them out, I just grabbed my camera and took a bunch of crappy pictures so I can show you one reasonably functional way of interlocking white girl hair. *You actually want to do some backcombing first! You just don’t have to worry so very much about making it extremely tight or uniform, because you are going to flip it anyway, and you can tuck in any irregularities and tighten any loose spaces at that point. I personally found that my hair was so fine and soft that just backcombing or just twist and rip resulted in dreads that fell out after a few days and one washing. When I combined all of these different methods I ended up with dreads that stayed on my head. 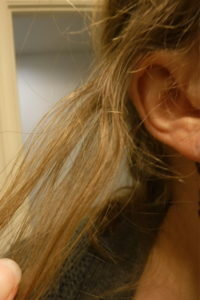 Especially the hair at the nape of my neck, which is the dreads I have pictures of. So here we go! For reference, this is my hair, undreaded. It’s pretty thin and soft. Step 1: Start at the bottom. So what this picture doesn’t show is what it would actually look like if you were flipping dreaded hair. So imagine with me that you have already done a moderate backcomb and you are finding that there are sections that seem not knotted up enough, or not dense enough. 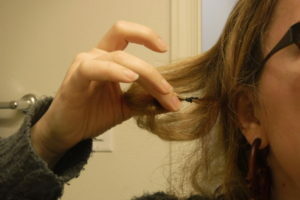 You’ll want to start at the bottom of your “dread” or knotted hair, and work your way toward the scalp. (Sorry for the “I totally just woke up” look.) 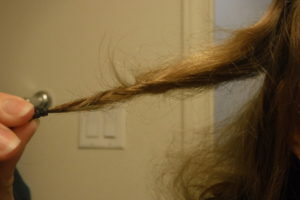 You will find a gap or loose space in your dread, and essentially you are going to “topsy tail” your dread through itself. (Remember topsy tails?) 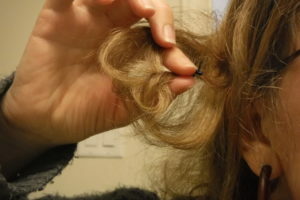 Some people use a crochet hook or a latch hook, but I found that my hair was so thin that I could run the very end of it through a yarn needle and just kind of “sew” through my dreads back and forth. This has the added benefit of not creating a back and forth pulling motion through the body of the dread, so I did not break any hairs. 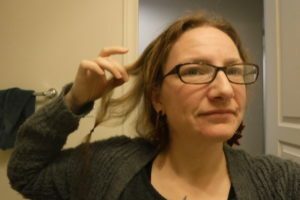 Yes, I did fold the end of my hair around the end of the needle like you would a piece of thread, but that was only for about two minutes total as I worked on that dread. Step 2: Flip your hair through itself! Step 3: This is the really important part! Change directions!! So, when you do your next flip, you are going to change directions and split your hair perpendicular to the first split. This kind of creates a cross-hatching of your hair, and stabilizes the dread so you don’t end up with a permanent split and weak spot. Then flip your hair through again! Okay, so see how we are stacking the twists on top of each other? If you want, you don’t have to go perpendicular every time, you can go in a variety of directions as long as you never flip twice in the same direction. 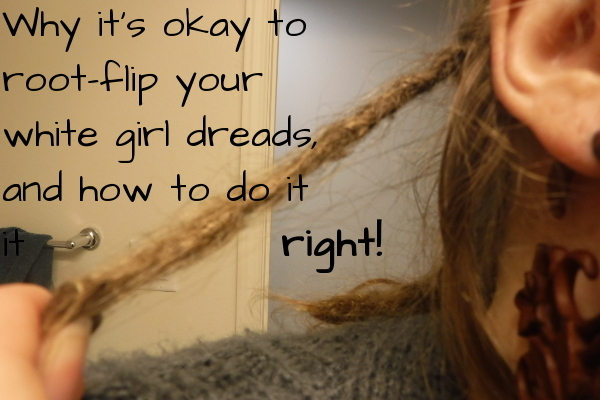 I heard this method can create weak spots and some people’s dreads fall completely out. Is that gonna happen to me? Not if you do it right! Weak spots occur when people root flip once, read about how bad it is, and never do it again because it’s “bad” and it’s going to make their dreads fall out. 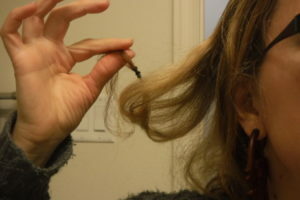 One root flip will weaken that spot on your dread because you are splitting without stabilizing. When you use root flipping as your general mode of dread maintenance, you should have solid, tight, strong dreads. How close to my scalp can I go? Will my hair fall out at the roots if I tighten it this way? I have no idea. Honestly, I always kept my roots loose between 3/4 to 1 inch from my scalp. It’s more comfortable for me that way. If you tighten them to the point that you are hurting your scalp, I imagine that you are probably at risk of pulling your hair out at the roots. It is completely up to you how close you get. 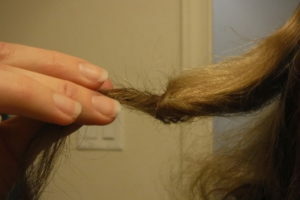 Personally, I didn’t usually bother flipping mine until there was about 1.5 inches of loose hair at the top of the dread. Will these be hard to wash? Will they get too tight? They might. Mine got quite solid quite quickly, and yes, they retain gunk even if you use residue free shampoo. 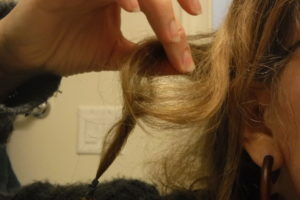 I’m pretty sure that anyone who cuts off a dread a dissects it is going to find gunk inside, even if you use residue free shampoo and care for them well. Sorry. I’m being honest. Mine never felt gross on my head, they always felt clean (I shampoo every other day). Can I still comb them out? Yep. Just takes longer and hurts more. I got all 40 of mine combed out in about a week just doing it here and there. Do these look woven or braided? They might at first, depending on your hair. But remember the thing about dreads is that they are always evolving. They are always catching loose hair (and lint) and pulling it in. So even if the surface looks a little woven at first, it won’t for too long. The more backcombing you do before flipping, probably the less woven it will look. Here are some pictures of what mine looked like by the time I was ready to comb them out at six months old. I didn’t care too much about loose hairs, so they were a bit fuzzy. But the core was tight with very little sponginess. Thanks for reading! Let me know how your dread journey is going! Was this helpful?